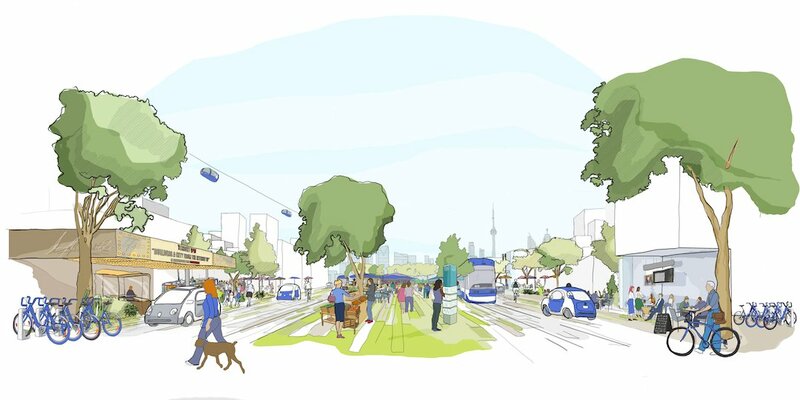 On this episode of Extreme Makeover, Google subsidiary Sidewalk Labs gives Toronto neighbourhood Quayside a $1 billion futuristic transformation. Prepare yourself for taxitbots, flexible buildings, and Neighbourhood APIs. Google–or Alphabet, to be more accurate (it’s hard to get used to that)–is putting Toronto’s eastern waterfront on a fast track to the future. The tech behemoth has announced an initiative as part of which it will transform a 12-acre region of the city into a futuristic smart neighbourhood and large-scale open-air lab experiment. The project is being helmed by Sidewalk Labs, an Alphabet subsidiary. Sidewalk Labs is an operation that is finding ways to accelerate urban innovation by running pilot projects that can serve as prototypes for more such enlightened municipalities across the world. Sidewalk Toronto is the first such pilot, for which they’ve partnered with government agency Waterfront Toronto. The $1 billion dollar project aims to transform the physical and digital infrastructure of the neighbourhood of Quayside. Sidewalk Labs will use a combination of technological innovation and community engagement to create what they hope will become a model neighbourhood. The company’s solutions span infrastructure development, energy production, waste management, and more. Here’s a look at some of the notable advancements set to be introduced in Quayside over the next few years. In Sidewalk Labs’ own words, they’re “building a neighbourhood from the internet up.” What that means is that the physical components that would traditionally constitute a neighbourhood are going to be connected, monitored, and governed by an underlying digital layer. This digital layer will be used to create a programmable interface opened out to designers through APIs, effectively turning this part of Toronto into a (regulated) canvas for software developers. This might just make Quayside the first neighbourhood that gives software developers almost as much power as real estate developers in civic and municipal matters. The idea that buildings need to be constructed for a singular purpose is so 2016. Most structures are built to last longer than a community requires them to serve their purpose. This results in cities that become crowded with obsolete structures that take a lot of work to revamp. Sidewalk Labs’ solution to the problem is something they call Loft–buildings with versatile cores and adaptable shells. Structures won’t be assigned one purpose for their entire lifecycle, but will be modified rapidly to fit the changing needs of the community. Quayside could see a parking lot become a makerspace, or a business district become a residential area a lot faster than that would happen elsewhere. It’s fairly evident by now that vehicular emissions are a major reason the ice caps are melting and we’re all going to die in a flood, so private car ownership is something the city planners at Sidewalk Labs want to deter. They plan on going so far as to allocating limited parking areas and making shared ride services easily accessible to realize their goal of a car-free neighbourhood. There will be a focus on innovation in the mobility sector, including experimenting with self-driving taxibots, vanbots, and buses. Sidewalk Labs will partner with Waymo to deploy the fleet of autonomous vehicles that will form the backbone of Quayside’s futuristic public transport system. There are also plans to pilot a personal aerial transit system, which could take the form of self-driving pods, cable-based systems, or dispatchable gondolas. We’re used to gaining access to online resources through accounts, but the residents of Quayside will have a lot more linked to their digital identities. Sidewalks Labs plans on establishing a secure portal that will mediate access to the facilities that form the neighbourhood’s physical environment. Residents will be given access to the various amenities and services via this account. It will also be used to grant access to homes in certain situations, such as when someone needs to allow a maintenance worker entry into their home remotely or the fire department requires emergency access into an apartment. The Account feature will also facilitate communication between neighbors, as well as between residents and the municipal authorities. They’re very convincing and can definitely work. Still, the posts are too brief for novices. Taxibots are awesome! I would love to just get through the entire city without having to worry about my own transport. I really hope that something like this takes off in other cities around the globe. With the “connected” world that we live in today, it just makes sense to move that direction. I would travel there just to check it out and experience it all first hand. even though the neighborhood is going to be that large, I would recommend that it does not have any vehicles. That just makes sense for the people that are going to be using it. It is safer and makes for a more welcoming area. I like that idea. Go with an API that developers actually have access to is a good thing to start with. Could this type of thing be susceptible to a terrorist hacking attack? If there is a wi-fi connection and some sort of network involved, I am not sure why it wouldn’t be. This is an interesting topic and it will be fun to watch as the news unfolds in a situation where a hacker takes over a connected city like this. Just reading through the comments here, it appears that people are very interested in the city. I am wondering when it will be 100% complete as I would like to visit and really test it out from an outsiders point of view. Does anyone know exactly where this city is located, so I can go take a look at it? says it’s combined yet nothing occurs. engine and also sustains third party devices. That is pretty awesome. Where do you find the time to make up programs like that? You would think there is a video or two of people being able to use this little park to show what it can really do, right? engine optimization, pay-per-click campaign management, website style, e-mail marketing and social networks advertising and marketing. I think it would be cool to have points in the area where a person could scan a QR code to get more information. It would really help the visitors that are not familiar. So many smartphones are out there, why not put them to use for a situation like this? Excellent video! I really hope that something like this takes off and is done in more of the larger cities around America and abroad. Its really great to see companies taking a look at other ways to offer people to get around. Cars, trucks and vans are just not efficient travel for people in the big city. I think this is the future. I have been living in a city that is really changing the way they use technology for those that live there. Yeah, I like that too. I have been thinking about moving to a large city because of things like this. Smaller towns just do not advance fast enough for what I would like. For just one easy payment of $1 billion you will be offered a top of the line experience in our new city 🙂 OR something like that! Yeah, I wonder how much convincing it took them to get the city to agree to something like this. Where I live, the politics of this scenario would blow up heads and nothing would get done! Modular buildings. That is pretty cool. As long as they can be modified to fit with today’s landscape, what’s the difference right? Many years ago we started to see more and more storage units around cities all over the world. Now, for a monthly fee, people had another garage. Many of those buildings were designed to offer different shapes and sizes of storage units. I can see the same concept being available for other types of buildings. Neat concept. This is awesome! Companies are trying to get the first flying car or even one that drives itself, but Google is looking at the future in a completely different way.